Inspired by the question here by sebastian.b, and the response to the subsequent meta question. I would like to ask how to achieve a specific photo effect. There may be more photographers that pull this off, but I know of two specific ones. 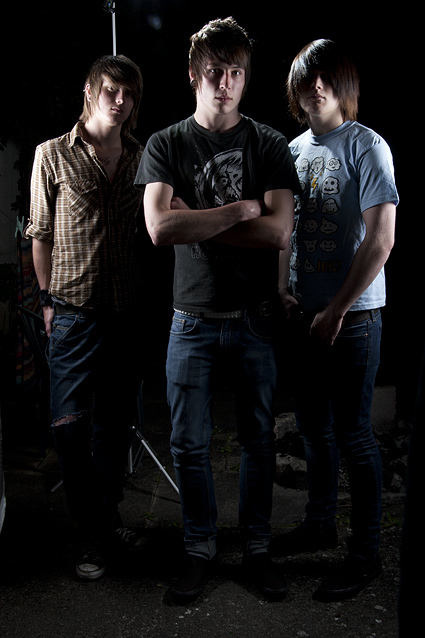 The first is the wonderful photographer, Dave Hill. I know that he does lots of post processing, and his talent goes beyond a short list of tips that I can learn from a website, but I think there is something that I can hope to understand. What is the Dave Hill effect? I have heard people talk about it, but what is it actually and how does one achieve it? On his webpage, the "Nerd ad", "Allen Robinson", and "Jon Heder" shots give the subjects a specific skin tone/saturation. In general, his portrait shots are amazing. The detail and texture mystifies me. How can I pull this eerie feeling off? 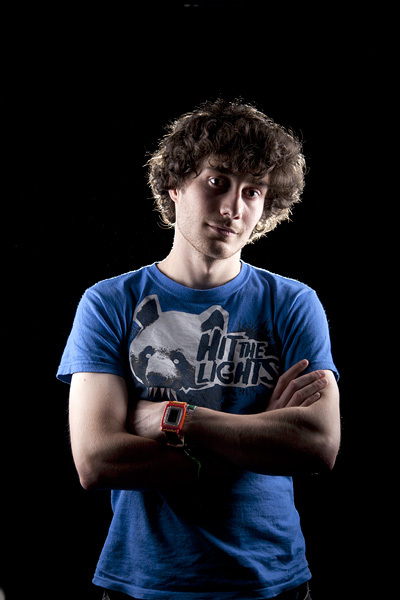 Now the second photographer is skylove from flikr. His shots are also extremely impressive. Again, he is using some black magic to make skin tone amazing. His subjects look beyond real, and I love it. Three specific examples are energy, discovering, king to defeat. Looking at energy, beyond the absolutely phenomenal idea for the shot and execution, and just focusing on the subject, he has this plaster/grey look, and his skin looks wonderful. Similar things are true for those other shots I linked. Some ideas I have had that might contribute to this are HDR or possibly just phenomenal lighting setups. I have watched the videos on Dave Hill's website, but they just make me think more-so that he sold his soul to Mephistopheles. I would appreciate any suggestions on how to achieve these results, or even some direction to go in this direction. ...the second image is the final image after Photoshop, mostly saturation, contrast and a little high pass filter in an overlay blending layer. I should have pointed out I didn't set out to get the Dave Hill look, I just wanted to play around and see what worked with the subject (the singer in a Ska band). I could have done more in post to get slightly closer to Dave's images. The softboxes were brought in really close to maximise the softness of the light, and angled toward the camera to increase the sculpting effect and falloff nicely across the face. Two "gobos" were used to stop flare interfering with the picture (the black lines in the diagram). This is absolutely essential when angling the strobes toward the camera! The hairlight at the back was bare (i.e. no modifier) to really penetrate Aaron's hair and make it glow. As less power is required for an unmodified light, I substituted a hotshoe flash for the big monolight. 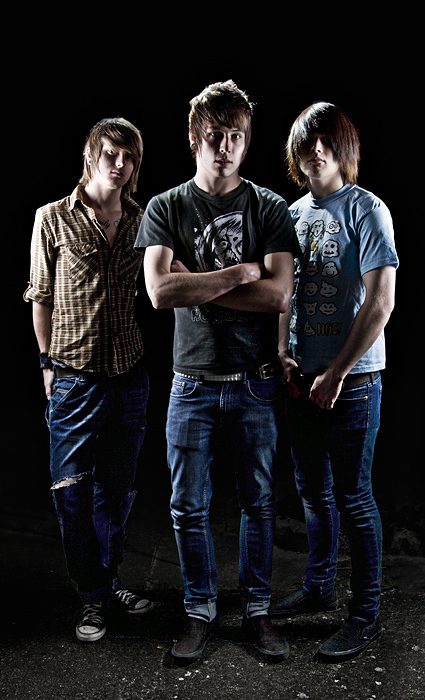 Here's another example of the same look in a group shot I did for the band Asking Alexandria. This one required a bit more post production (as lighting groups is much harder) so I'll take it step by step to show you what sort of post production you can do to push the look to its limits. As before, lighting is still very important. 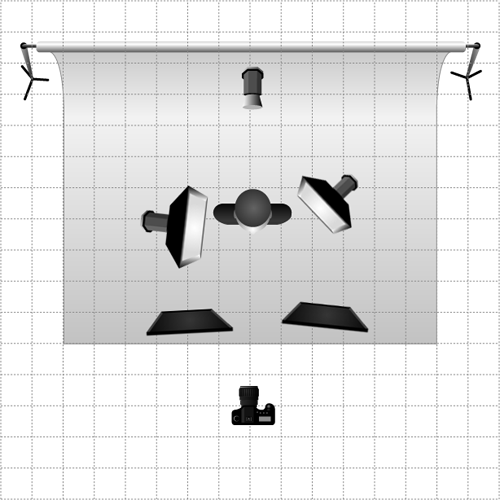 I used a very similar setup to the previous example but with the softboxes much more symmetrical. The models stood in a triangle pattern so the light hit everybody. The hairlight is also much higher this time as we're lighting the top of the head, not shining through anyone's hair (which would have required three hairlights in this example). You can see the lightstand for the hair light in the straight out of camera shot, behind the guy on the left. Here's the image after Raw conversion in Adobe Camera Raw, where I added a little of the clarity slider, brought up the black point and used a lot of the fill light slider. I wasn't going for any specific look, just to get an image with detail and a good tonal range to work with. The background clutter has been removed by a manual selection. Also note I've made the image taller by adding more black. I planned to do this so I shot the original very tightly cropped to make the most of my megapixels (I didn't do this with Aaron as some of the shots we took involved a lot of movement). Here I've faded a little of the ground into the image with a gradient mask in order to ground the models and make them look a little less like they're floating in space! Next I went mental with the Photomatix tonemapping plug-in! With any sort of HDR work, taste and subtlety is important. I find the easiest way to achieve this is to push it as far as I can and then fade it into the original at a very low opacity to retain some realism. Here, it is reduced in opacity to 30%. I actually lowered it to 15% in the final version, as I just wanted to show the effect in bringing out the details in the legs and shoes that was lost due to the fact I concentrated on lighting the faces (and didn't have any striplights to hand). It's also done a nice job with the hair. Now here's pièce de résistance of the post processing. I've duplicated the original applied a high pass filter (which removes small details such as noise) and leaves large scale tone changes. The layer is blended back in at 30% with the blending mode set to overlay. This is very important, as it sort of amplifies the high pass by lightening the lights and darkening the darks. It's starting to look how I want it now. Here's the final image after some fiddling; dodging and burning here and there, and some minor colour correction (I moved the jeans away from cyan and desaturated for a more pleasing look). Desaturated skin tones makes this lighting technique look better in almost all cases. Finally, the image is resized and sharpening applied, leaving an image which I think captures the look you are going for based on the examples posted. It's worth noting that you need a dark place in order to pull this off otherwise you lose control over the light and you will have difficulties getting the deep shadows required for maximum contrast. The first image of Aaron was shot in a black walled studio, but if you don't have access to a studio you can get the same effect in any large space. The size is important as the light that gets reflected back from other objects falls off with the squre of the distance (double the space, 4x less light bouncing off walls), up to the point where it is totally overpowered by the subject and you get a nice black background. If you're looking for a large space, the great outdoors comes in very handy! Not the answer you're looking for? Browse other questions tagged post-processing lighting tutorial or ask your own question. How can this visual effect be achieved using Photoshop or plugins? How to get 'plastic' skin tones in a picture? Why do it “in-camera” rather than in post-processing? What is a good Canon lens to take portraits? What settings do I have to use to take pictures like this one by S Dot B? How do I combine multiple exposures for action shots? How does one create the Dragan Effect? How does one do light painting with in focus subject? Maybe a composite? How can one capture gun bore shots? How can I use a reflector for wider group shots? How was this photo edited to feel vibrant and lush, but also soft? How to create this effect on a portrait with light of different colors on each side of the face?